Since this article was first published, I have been informed by Thomson Reuters RealLegal technical support that their developers are aware of this issue, and they will have the issue resolved by first or second quarter of 2018. In the meantime, lawyers and law firms with a subscription to Adobe Creative Cloud Suite, which includes Adobe Acrobat DC Pro, can use the fixes described in this article to regain full PDF deposition transcript functionality. It’s probably safe to say all of us who spend most of our days working on a PC have a love/hate relationship with automatic updates. Just last weekend, Windows 10 hijacked my laptop with updates for about a half hour, and one of the apps I use almost every day, Adobe Acrobat DC Pro, was updated to Version 2018.009.20044. Normally, after getting over the annoying loss of use of my laptop during extended updates, I am confident that my machine is in tip-top shape and even more secure. However, after this last round, I noticed something very different in my Adobe viewer after producing deposition transcripts. Court reporters use court reporting specific software on their individual laptops to create transcripts of the depositions or trials they report. However, the end-users (attorneys) rarely ever see this stripped-down version of the transcript. Instead, court reporters will send a simple .txt file to their court reporting/litigation support firm who then create the final, highly-functional transcripts end-users actually see using a separate transcript production software. Professional transcript production software, such as Thomson Reuters RealLegal, will create the incredibly click-searchable and hyperlinked e-transcripts (.ptx, .ptz), as well as the bookmarked and hyperlinked PDFs most attorneys rely on for their trial preparation and organization. But there’s a catch: While these transcript production software providers have complete control of their own proprietary transcript viewers, they have no control over the changes Adobe may be making to the way in which PDFs are viewed when Adobe updates or rolls out the latest version of its own software. Most software that produces text documents will have a PDF printer written into its code, and sometimes when Adobe updates its own software, all aspects of the PDFs created in the native software may not be completely readable by the newest version of the Adobe viewer. It may take a little time for the developers of the native software to update their own PDF printers to once again become completely compatible with the Adobe updates. If you use a paid version of Adobe, including Acrobat DC Pro, the update to version 2018.009.20044 may affect the viewing of bookmarks included in the PDF transcripts you receive from your court reporters, including the word index and hyperlinks to exhibits. When you open the bookmarks to the left of the body of the transcript, it will appear that the click-searchable word index is incomplete, and you may see links to only a few exhibits. However, this is not a corruption in the PDF file itself; rather, the new viewer in Acrobat 2018 is simply not recognizing the complete bookmarks or all the hyperlinks. After speaking extensively to tech support at Thomson Reuters RealLegal, I learned there are two very easy fixes to this issue until their own developers can catch up with the changes Adobe has made to its Version 2018 PDF viewer. 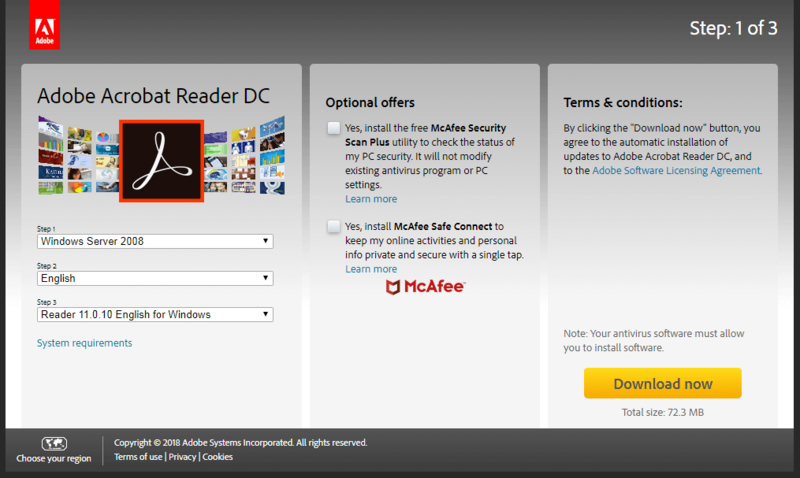 Adobe has made it increasingly difficult to download earlier versions of Acrobat, but it is still possible. If you are an Acrobat DC Pro user, to regain full PDF transcript functionality, you can download Adobe Reader 11.0.10. After visiting the link above, select Windows Server 2008 from the drop down box in Step 1 above. Then select English as your language in Step 2. Finally, select Reader 11.0.10 English for Windows in Step 3. Make sure the boxes in the Optional Offers are unchecked, and select Download Now. Once Acrobat Reader 11.0.10 is installed on your PC, do not make this your default for viewing PDFs. Rather, if you use a paid version of Adobe, you will probably want to keep that version as your default PDF viewer and use this older version for the sole purpose of viewing PDF transcripts from your court reporter to enjoy the benefits of click-searchable bookmarks and hyperlinks in those files. After Adobe Reader 11.0.10 is installed on your PC, right-click on any PDF transcript file on your PC you wish to view, select open with, and then select Adobe Reader 11.0.10. All bookmarks and hyperlinks will now be viewable and functioning as they did prior to the DC Pro update. A second way to combat the effects of the Adobe update to Version 2018 and still enjoy all the transcript functionality you depend on is to ditch PDFs altogether and work solely in e-transcripts (.ptx, .ptz). As a working court reporter and firm owner, I often have to research prior transcripts in a case for an upcoming realtime deposition, or when I am reporting a case other reporters have been on prior to familiarize myself with the content, vocabulary, and proper names for that particular case. In every instance where I need to review prior transcripts, I always go straight to the e-transcripts. E-transcripts were designed and created specifically for the litigation support industry, and they are simply cleaner and less clumsy than PDFs. An issue I have always had with PDFs of any sort is a lot of their functionality is based on a double-click. As we all know, if you don’t double-click fast enough, what ends up happening is the words you were trying to click on become highlighted and lose their functionality, and you end up having to click out of it and try again. With e-transcripts, every function is performed with a single click. Now, there was a time not too long ago when you would have to pay extra for an e-tran, but in today’s litigation support world there are many court reporting firms that will offer them as standard with your transcript order. Even if you do not use a case management software like Westlaw’s Case Notebook, you can still get all the functionality that you were getting out of your PDFs by downloading the free E-Transcript Bundle Viewer and start working solely with e-transcripts. If you are unfamiliar with e-transcripts, ask your preferred court reporting firm to walk you through all their functions and benefits, and you may never go back to PDFs again! Yet another great thing about e-transcripts is if you do need to work with a PDF, or if you need to print a condensed or full size PDF for filing, the PDFs are already embedded in the e-transcript (.ptx) files. So not only do you have superior and cleaner file functionality with the click-searchable index and hyperlinked exhibits with an e-transcript, but you also have the full size and condensed PDFs of the transcript all in one compact file. To extract PDFs out of an e-transcript, simply go to file and then print, then select transcript, then select full size or condensed. Next, a printer pop-up box will appear, and simply select Adobe PDF as your printer and save the PDF to your PC. Data security is so important in today’s society, and electronic documents in litigation are no exception. Simply put, e-transcripts are the most secure transcript files. The e-transcripts you receive from your court reporter will be encrypted with a digital signature footprint to protect against corruption and/or wrongdoing by a malicious user. Learn more about digitally signed transcripts here. As I said earlier, it is just my personal preference to use e-transcripts over PDFs for all the reasons stated above. However, if you prefer PDFs and you are not using a paid version of Adobe, the good news is the update to Version 2018 will probably not affect you at all, and you can simply carry on with your life as you were. 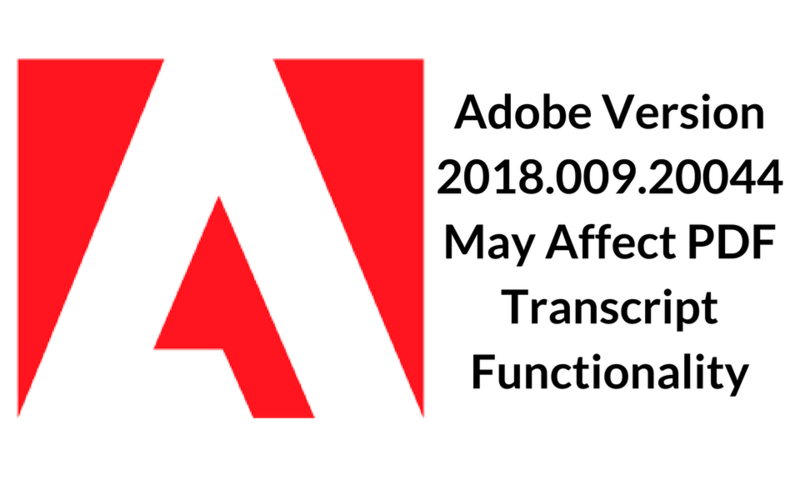 However, if you are affected by Adobe’s latest update to Version 2018 with regard to transcript functionality, the solutions above can get you back to enjoying all the time-saving functions professionally-produced transcripts offer. And as always, if you have any questions regarding transcript files of any type, contact your local court reporting firm, and they should be happy to assist you in any way they can.